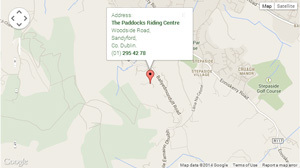 FAQs - Horse Riding Centre Dublin, riding lessons, livery, horses riding school, stables, pony trekking, equestrian centre, Dublin Mountains, Wicklow, Ireland. 1. What is the difference between a lesson and a walkout? We have lessons and walkouts to suit both adults and children who are complete beginners. Lessons take place in the arena with one of our qualified instructors. During a lesson, you will be taught how to ride your horse or pony. Beginners will be taught how to stop, start and steer and will begin to learn how to trot. There are lots of intermediate and advanced lessons available for more advanced riders. Beginner group lessons take place at 2pm on Saturdays and Sundays. These are suitable for both adults and children. Walkouts involve a ride up into the scenic Dublin Mountains on your horse or pony. Each walkout will have an experienced trek leader. Beginners will be accompanied by a leader who will walk beside you on foot. Beginner walkouts take place at 1pm on Saturdays and Sundays. These are suitable for both adults and children. 2. What is the difference between a walkout and a rideout? Walkouts are suitable for everybody from beginner standard upwards. They involve a ride up into the scenic Dublin Mountains on your horse or pony. Each walkout will have an experienced trek leader. Beginners will be accompanied by a leader who will walk beside them on foot. Walkouts are a gentle option which include walking only. We have intermediate and advanced rideouts available for more experienced riders. Intermediate rideouts are suitable for people with a good standard of riding who can competently control their horses in both the walk and trot. Anyone wishing to go on an advanced rideout must be able to canter very competently. Please note that we will not allow any riders who have not been previously been assessed at the Paddocks to go on an advanced rideout. 3. What is the difference between a group and private walkout, rideout or lesson? Group walkouts, rideouts and lessons take place at pre-scheduled times according to our school timetable. If you book into a group ride, there will be other riders in your group besides those that you have come with. Private walkouts, rideouts and lessons can be booked by calling 087-2237981. If you choose a private ride, you will ride with just the people that you have booked in and the trek leader or instructor. We accept both cash and cheque. Please note that we cannot accept credit or debit cards at this time. You should wear comfortable clothing and bring waterproofs with you in the event of rain. Long trousers are preferable over shorts as these can be uncomfortable when riding, particularly on hot days. 6. Can I borrow equipment? You can borrow riding boots and hats which comply with the latest safety standards. Please note that we do not lend out back protectors. We have a wide range of equipment available for sale at our onsite shop including hats, boots and back protectors. 7. How can I get to the Paddocks? 44 Bus - Larkhill to Enniskerry. Get off at the Stepaside stop. It is a 20 min walk from Stepaside to the stables. Please see the map on our Contact Us page for further directions. 44B Bus - Dundrum Rd-Ballybrack Rd Hillview. Get off at stop 19.It is a 5 minute walk from the stop to the stables. Please check Dublin Bus website for the bus schedule. 8. Does it matter if I have never ridden before? Not at all! We have group walkouts and lessons available which are suitable for complete beginners. We have group walkouts every Saturday and Sunday at 1pm and group lessons every Saturday and Sunday at 2pm. These are suitable for both adults and children. Private groups can be arranged by contacting 087 2237981. 9.What happens if someone some people in my group are experienced and others are not? For safety reasons, we will always cater the pace of ride to the weakest rider in any group. If you are an experienced rider and others in your group are not, the ride will be aimed at the least experienced rider. 10. What time should I arrive at the stables? You should arrive at the stables at least fifteen minutes in advance of your ride so that we can fit you with hats and boots and fill out your registration form. 11. How do I buy Gift Voucher? Gift vouchers can be purchased onsite in the Paddocks Riding Centre Office. Alternatively, we can arrange for vouchers to be posted or emailed to the relevant person. Vouchers are valid for 6 months.